You don’t need expensive rack-mounted hardware synthesizers or a powerful PC to create good music. Your smartphone in your pocket is much more powerful than you realize. If you are a musician or just someone who just started to learn composing music, here are some of the best Android apps to compose music on the go. 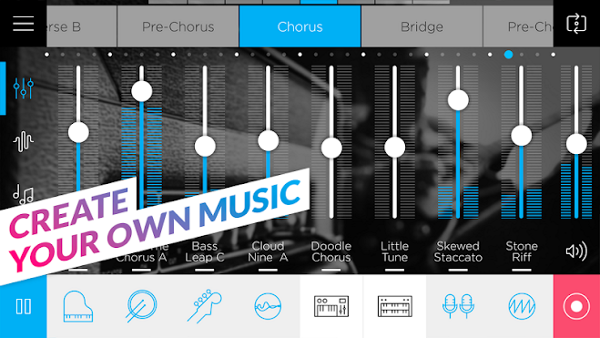 Music Studio is a full-fledged music composer app that has a pretty extensive music production environment. There are all kinds of instruments to create and compose music to your heart’s content. There is a tracks and effects section where you can combine multiple tracks and add effects using a variety of options. The effects panel gives you so much control over customizing your music. If you are looking for a really detailed and feature filled application then look no farther than Music Studio Lite. Due to poor audio implementation in Android devices, the Android version of Music Studio has a slightly reduced feature set (such as Compressor, Phaser) compared to the iOS version. 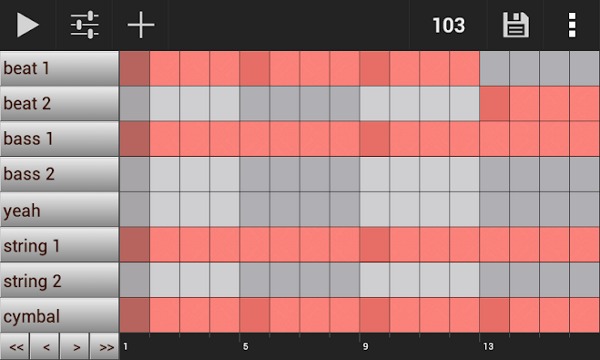 Groove Mixer is a simple application that lets you create drum beats. If you are into creating music beats, Groove Mixer is a pretty good app thanks to its user-friendly user interface. 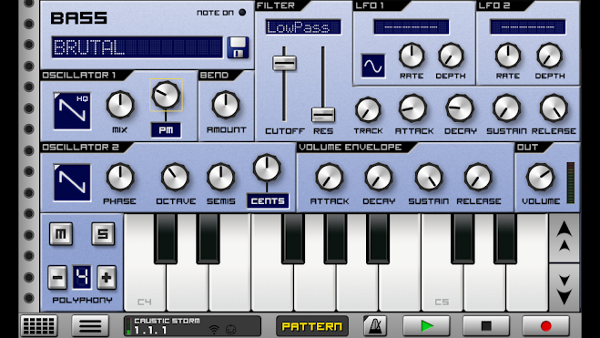 The app includes pattern mixer, pattern sequencer, step sequencer, etc., to properly mix and create music beats. Price: The app is free and contains ads and in-app purchases. You can remove ads by buying the pro version for $7.49. 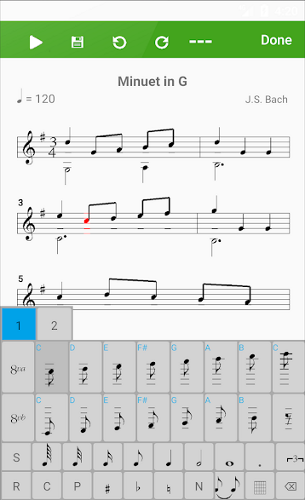 As you can tell from the name itself, Score Creator is a dedicated app to create and compose sheet music. The good thing about Score Creator is the intuitive user interface which lets you add notes by simply tapping on the Notes and Cords keyboard. No need for any messy dragging and dropping. Features of Score Creator include support for multiple tracks, different instruments, ability to playback sound as a whole or on per instrument basis, transpose songs into keys, etc. 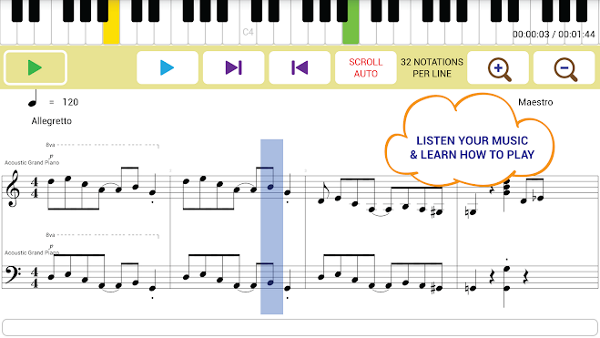 If you like creating sheet music then do give Score Creator a try and see how it works for you. Price: The app is free and contains ads and in-app purchases. Music Maker JAM is one of the most popular apps and has a ton of features to compose the music of your choice. The app has 300+ mix packs, remix tracks, and thousands of studio quality loops. Apart from composing and creating music, you can record vocals to create songs. 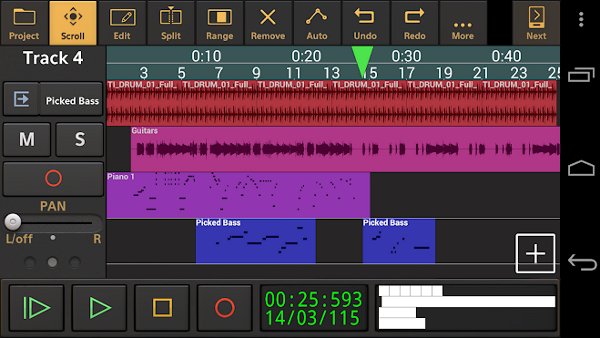 The best thing about Music Maker JAM is that controls for different instruments, effects, options are arranged in such a way that it makes it easy to edit parts of song or music. After creating your music, you can share them with the world and even submit them to global challenges. If need be, there is a huge community of Music Maker JAM users to help you get started. Price: The app is free and contains in-app purchases. 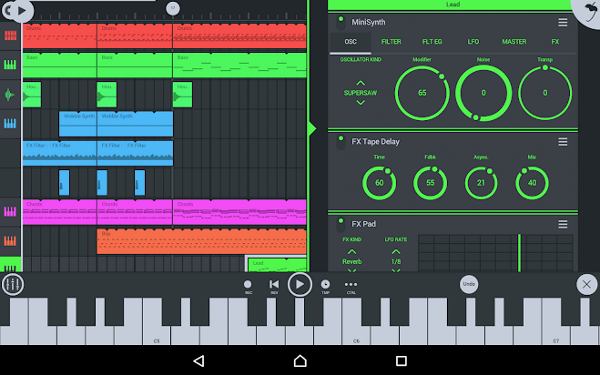 FL Studio Mobile is another hugely popular app to compose, edit, and mix songs on your mobile. What makes FL Studio Mobile special is its awesome user interface and the number of tools and options you get to compose music. Some of them include built-in high-quality synthesizers, drum kits, MIDI controller, built-in audio engine, mixer with a wide range of options, built-in effects, piano roll editor, presets with patchable previews, etc. Simply put, FL Studio Mobile is mainly aimed at experienced users. That being said, if you are looking for a powerful mobile music composition app or to improve your skills then FL Studio Mobile is for you. Price: The app costs you $14.99 and has in-app purchases for additional content. Maestro is very similar to Score Creator app in that it lets you create sheet music. 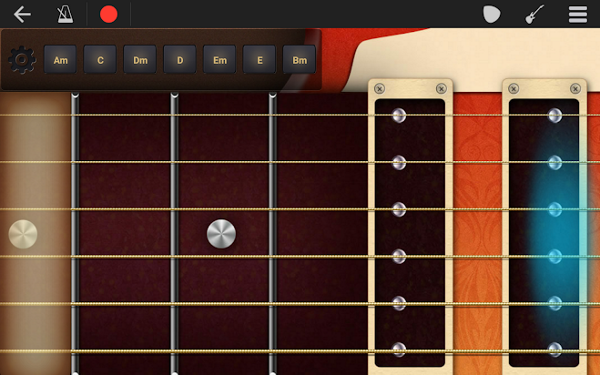 The app is mainly aimed at songwriters and music students. 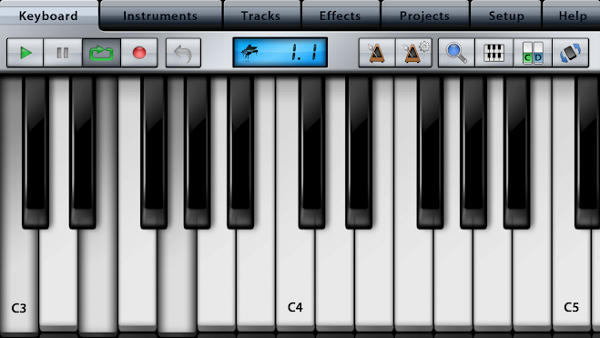 Maestro supports multiple instruments like Piano, Violin, Drums, etc., and lets you compose in multiple tracks. When needed, you can play back the music you wrote. Once done, you can even export it as an image. Walk Band has several virtual instruments like Drum pad, Drum machine, Bass guitar, piano keyboard, etc., to quickly compose and create the music you want. The user interface of the app is pretty minimal yet very beginner friendly. Each virtual instrument takes up the whole screen and gives you plenty of space to compose the music. As the name implies, when you have multiple friends to play with, you can actually perform like a band by selecting unique instruments for each user. As you can tell from the name, DJ Studio 5 is a virtual DJ Studio or turntable with a wide range of features and tools. The user interface of the app is really good looking and ergonomically designed. 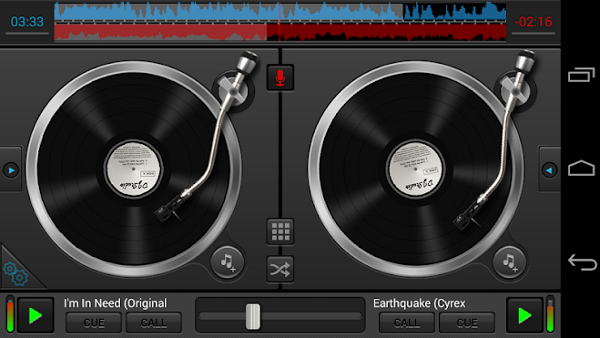 DJ Studio 5 has two virtual turntables with their own scratch engines and physics. Other than that, you can customize the deck with custom skins, live record your mixes, edit or re-order playlist, apply multiple sound effects as and when needed, loops, equalizer, ability to live sound spectrum, customizable sample pads, and much more. If you are into DJing or mixing sounds, try DJ Studio 5. You won’t be disappointed. Price: The app is completely free and contains ads. You can remove ads and purchase deck skins via in-app purchases. Of all the apps shared here, Caustic 3 is pretty unique in that the user interface of the app is inspired by rack-mount sampler rigs. Which simply mean that while composing you’ll get to play with a lot of dials, slides, and buttons. After installing Caustic 3, you can create your own rack and add different machine like FM synth, SawSynth, SubSynth, Organ, BeatBox, 8BitSynth, Modular, etc. No only you can add different machines but you can set two effects per machine. On most machines in Caustic 3, you can automate a range of things and even customizing the automation by changing the curves to meet your needs. Price: The base app is free but you cannot save your creations. To save your compositions, you need to purchase the Caustic Unlock Key for $9.99 and unlock the full version. Audio Evolution Mobile Studio is a beginner friendly multi-track audio recording and music composition app. The app allows you to record using either the internal mic or USB audio or MIDI interface. Using the provided virtual instruments you can compose music, add effects, create loops, and do many other things. If needed, you can export DAWs by rendering them into separate tracks. Other features of the app include Metronome, cloud sync with Google Drive, effects and mixer automation, offline and real-time effect, etc. If you are looking for a professional grade application to record vocals and create music then do try Audio Evolution Mobile Studio. Price: The free version is just a trial and some features are limited. For full features, you need to purchase the pro version for $6.99. Which is the Music Composer Apps? Hope that helps. If you think I missed any of your favorite music composer apps then comment below and share them with me. Also, check out the MusicMemos and GarageBand app from Apple. With the former app, you can hum a melody and it tells you the notes while GarageBand is also great for creating music, plus bot are free.